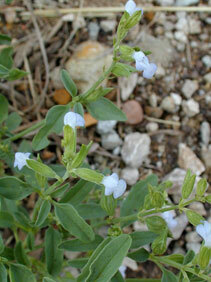 Also Called: Rocky mountain sage. Stems: Erect or ascending, branched above base, minutely pubescent to glabrous. Leaves: Opposite, lanceolate to narrowly elliptic, up to 2 inches long, less than 1/2 inch wide, usually glabrous above, pubescent or glabrous below; margins entire to slightly toothed; tips blunt or rounded; stalks 1/5 to 4/5 inch long. Inflorescences: Spike-like, interrupted, 2-6-flowered clusters; bracts lanceolate, less than 1/4 inch long, much shorter than calyx. Flowers: Flowers mostly opposite, 1 per axil; calyx bell-shaped, 1/4 to 1/3 inch long, 2-lipped; corolla 2-lipped, 1/4 to 1/3 inch long, dark to pale blue or whitish, minutely pubescent outside, glabrous inside; upper lip cap-like; lower lip turned downward; corolla tube protruding only slightly from the calyx; stamens 2. Fruits: Nutlets, egg-shaped, about 1/10 inch long, smooth, tan, mottled with dark brown. Habitat: Disturbed areas, pastures, roadside ditches, and prairie washes; dry, sandy or gravelly soils. Toxicity: Toxic to cattle, sheep and goats due to its accumulation of nitrates. This can also occur when it is fed in hay. However, this is rarely a problem because animals must consume large amounts of the plant and it occurs infrequently. Comments: Lance-leaf sage is very aromatic.